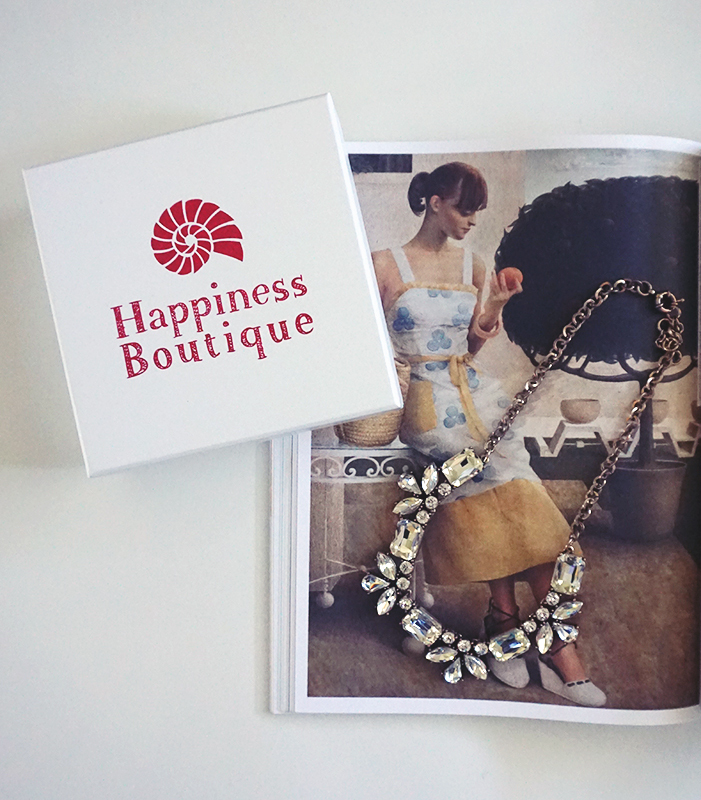 I was lucky enough to be sent this gorgeous necklace from Happiness Boutique the other day. When they approached me about reviewing a necklace I was so keen as they have soo many gorgeous ones available on their website, and all with free shipping! That's what a girl wants to hear. It's only too often I have to run away from shopping at an online store as shipping to Australia is like $40. Bah. There were quite a lot of beautiful necklaces to choose from, and I spent a while browsing through the collection. I decided I wanted to go with something basic, that would work with a lot of outfits, and not too much colour. Nothing too bright. Finally I settled on the Tranquility Statement Necklace and I couldn't be happier! I styled it with my black skinny jeans, white button up shirt and Camel coat. I love how this necklace is quite versatile, as I can wear it with a collared shirt but it would also look lovely with a pretty and feminine dress. Happiness Boutique also has a rewards program, where the more you shop, and review your purchases on their website, the more points you earn. Then the points can be exchanged for goodies like jewellery and clothing. Which is really nifty. I wish more of my favourite online shopping destinations had rewards programs. It's definitely an incentive to shop and to review your fav products. I don't know about you, but I love reading reviews before I buy things. I don't have too many necklaces, as I'm a staple jewellery piece kinda gal, but I'm glad to have the Tranquility necklace as part of my collection. It will definitely find it's way into outfits in the future. Some of these items may have been sent to me for review purposes. See my full disclaimer here. Oh my gosh, the necklace is fabulous! And it works so well with your whole outfit! I've heard of Happinss Boutique, and their necklaces are a dream! Love how you styled it on top of your shirt! That camel coat is to die for too, I've been looking for one, but can't bring myself to buy one since it's rather warm where I live, and I'm not too sure if I 'd get to wear it at all. 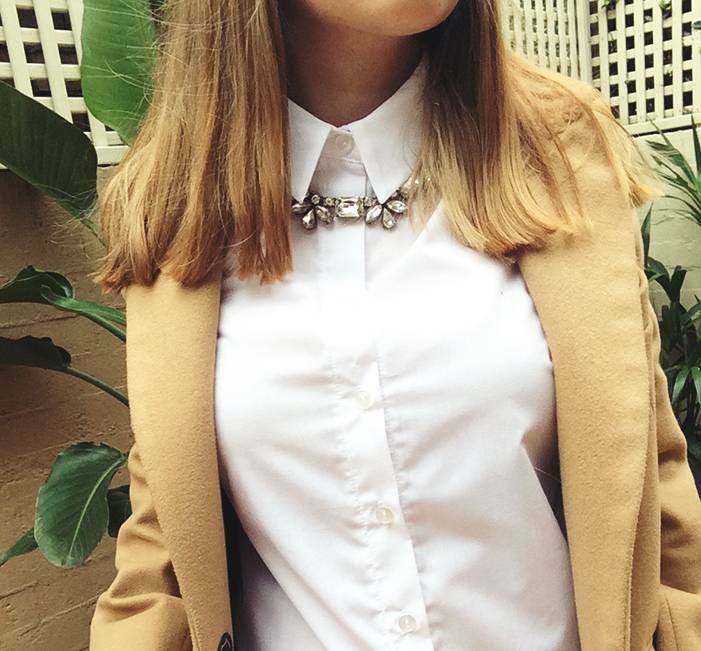 Been hearing of Happiness Boutique all round the blogosphere and I'm so in love with their necklaces. Yours is such a pretty piece, and I LOVE wearing necklaces around buttondown collars, too! Gorgeous necklace! and I love what you've teamed it with. THAT CAMEL COAT, I NEED.